● Advance online helicopter booking services for date 01.04.2017 and onwards shall only be allowed w.e.f. 01.03.2017. The inconvenience caused is regretted. 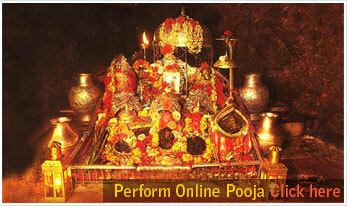 ● Free online yatra parchi available at https://www.maavaishnodevi.org/OnlineServices/YParchiServices.aspx (between 5:00 AM to 10:00 PM everyday). ● The online facilities shall be available starting 60 days in advance for any given day with opening at 10:00 am. ● Arti can be booked through online service on SMVSB website only. ● All the devotees who avail the facility of Atka Darshans against payment of prescribed amount shall be provided Prashad Kit. ● For the safe guard of valuables, devotees can use locker facility at Bhawan. ● Free Yatra Slip is also available at Vaishnavi Dham Jammu and Railway Station Katra. 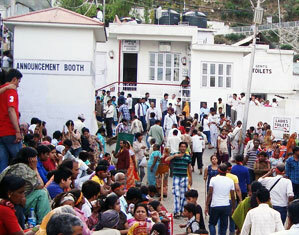 Obtain yatra slip from the yatra registration counter at the Tourist Reception Centre at the Katra bus stand. Without yatra slip, crossing of the Ban Ganga check post is not permitted. Take official receipts for all payments made to the Shri Mata Vaishno Devi Shrine Board (SMV Shrine Board) as well as those made to private vendors. Demand to see official rate lists when making payments. Fellow pilgrims are bound to you by their faith in the Mata. Avoid playing transistors or tape recorders too loudly or creating blockage or hindrances in the passages meant for circulation of the yatris. +more Kindly tell us your present ness. Fill or View our Guest book. 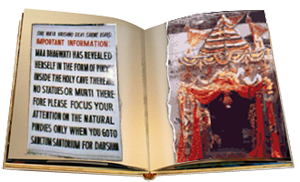 Visit our image galleries, where you found, some rarest photographs of Mata Vaishno Devi. 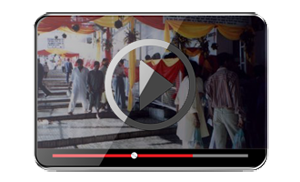 Enjoy with very famous video songs of Shri Mata Vaishno Devi ji. Mostly songs sung by some famous singers like Narendra Chanchal etc. Highly effective and deep religious MP3 songs of Matarani like Shri Med Devi Bhagwat Puran, Durga Saptshati, Durga Amrit Vani, Artiyan & many more.